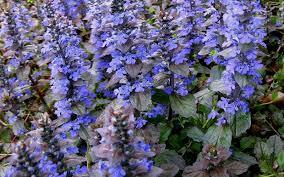 Ajuga is also known as Bugleweed. Bronze Beauty Ajuga grows best as an evergreen groundcover in shady areas. It has burgundy bronze leaves with spikes of short, deep blue flowers that will appear in mid to late spring and bloom through early summer. It will grow up to 6" tall and 12" wide. It will grow fast forming a thick mat. It will attract bees and butterflies when in bloom. Bronze Beauty Ajuga works great as a ground cover, in containers, Woodland Gardens, and Rock Gardens. You can even use this plant in Topiary. Bronze Beauty Ajuga is also a Firewise Plant.